Binge eating is a psychological disorder characterized by episodes of eating excessive amounts of food in one sitting, even when the person is not physically hungry. Bulimia is characterised by the consumption of large amounts of food, which is usually followed by self-induced vomiting, laxatives or diuretic misuse. Anorexia Nervosa is a condition of excessive deliberately induced weight loss. It usually starts as a result of dieting or excessive commitment to physical exercise. It soon leads to a total preoccupation with body weight and shape and rigid control of eating. Individuals become completely absorbed in their dieting and exercising so their ability to relate to their family and friends is disturbed. Eating disorders can be grouped under Anorexia nervosa, Binge eating disorder, eating disorder not otherewise specified (EDNOS), Bulimia and Compulsive eating and to a lesser extent yo yo dieting or cupboard eating. 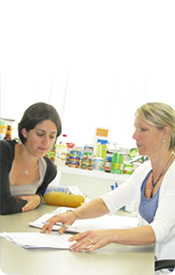 In treating eating disorders, a detailed dietary history is usually taken and then individual needs are addressed.Diets are designed that are suitable for the individuals.